Beaded Fashion Jewelry is India based manufacturer and exporter of beaded fashion jewelry,beaded costume jewelry, designer costume jewelry, beaded necklace,beaded bracelets and handicrafts for buyers across the globe. Opine India, Delhi has been founded in 2001 as a recognized manufacturer and supplier of beaded jewellery such as beaded necklaces, beaded bracelets, beaded earrings, brass cuffs, wooden bangles and fashion belts. Through these years, we have been catering to the needs of our clients across the world with great efficiency. The products of our company is a unique blend of unique Indian art & culture and modern selections. Our efforts are directed towards proViding our clients with fresh items both in terms of innovation and quality. 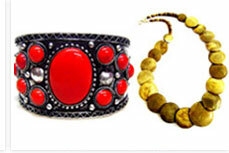 We customize jewellery products according to the specifications provided by our clients. We are also capable of meeting bulk demands and our efficient delivery system takes care of the delivery time. Opine India, Delhi has manufacturing units with state-of-the -art technology. We have employed some of the best skilled craftsmen who understand the concept of jewelry designing with perfection. At the same time we keep ourselves abreast with the latest technology and continuously seek innovations in our business. In the existing competitive market, technology forms the backbone of every business. We own and maintain a world class infrastructure for manufacturing our products. We have a huge network of professionals that include skilled technicians, adroit craftsmen, designers etc. Quality is one of our major concerns and we realize that how quality is one single factor that help establish healthy business relation with our clients. Opine India, Delhi believes in innovation and creating trends in the market. Till now, we have been able to create some stunning designs that are still in demand. Strict quality control procedures are followed to check the quality of the products. We make sure that the products packed are free of any defect. Qualified people are assigned the duty of checking the quality of the jewelry items regarding design, color, shape and alignment. Our aim is to provide the best quality products at the most competitive prices. Our high quality fashion jewellery are marketed in various parts of the nation and they are also exported to several countries across the world. However, the major chunk of our exports can be found in the markets of South Africa and Canada. We have received positive feedback from the international clients hence, we are planning to expand our business to other countries as well. We have been experiencing increasing demand of fashion jewellery specially in the last few years.